A lover of words my entire life, I spend a lot of my day job as a museum curator writing for exhibits, articles and other academic things. 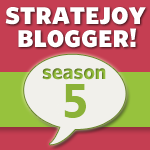 I caught the blogging bug when I was honored to be a Season 5 blogger for Stratejoy in 2011. Around the same time I became a Stratejoy blogger, I started the process ( at the age of 28) of ending my marriage of about a year and a half. Writing about my struggle and gaining support from the tremendous community of the interwebs allowed me to work through the static in the brain and write myself back into life. I am very much on the learning curve of learning how to be a great blogger, but writing about life and all its various musings brings me great joy and I’m very happy to be a part of this community. I’m a curious learner with a passion for research, arts, history, and culture. Writer, curator, painter. Lover of all things food. Addicted to tea & books. Partner of the amazing Q. Bonus mom to Little Man. Follow me as I explore my new world, enjoy adventures, try new things, and see what life brings my way! Hi Kristen! I was reading Erin’s blog this morning – and your guest post – and I couldn’t believe it when I saw your picture and said “I know her!” Thought I’d drop by and say hi – it looks like you are doing well and having some fun adventures – I love your blog! Happy Holidays!